Take a tour of the new DG800/900 Family. These videos allow you to experience the new touch UI and explore the advanced capabilities of this powerful new generator. The DG800 and DG900 combine outstanding performance, advanced features, and a next generation UI at a significant savings versus competitive brands. Check out the comparison. Create and combine complicated sequences of signals for emulation or failure analysis with the touch of a finger. Combine cycles of different waveform types including dual tone, arbitrary waves, noise, PBRS, or arbs to create test sequences for advanced applications. Complete test sequences from the front panel for waveforms that used to require interactive PC control, saving time and money. Both the DG800 and DG900 Series generators provide 16 bits of output resolution. With 4 times as many output voltage options vs traditional 14 bit generators the DG800 more reliably reproduces any waveform, improving signal fidelity and performance. SiFi point to point sampling insures high fidelity arb generation with easy setup and adjustment. SiFi II enhances this capability by adding interpolation, step and smooth filtering options which allow users to modify waveform characteristics in both the time and frequency domain. The combination of 16Bit Resolution, exceptionally long arb memory, and SiFi II delivers unmatched flexibility and signal fidelity. RIGOL is proud to bring you the most affordable portfolio of 16Bit Generators on the market. 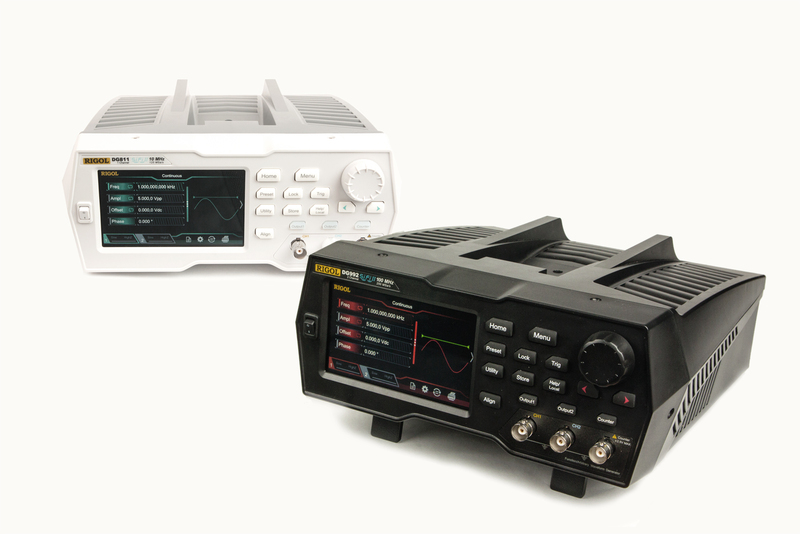 The DG800 and DG900 allows you to generate up to 8 Harmonics of the base signal. Simple setup and configuration lets you quickly produce harmonic signals to generate complex RF environments or inject system noise. Engineers testing digital communication links need to generate Pseudo-Random Bit Streams (PRBS). The DG800 and DG900 simplifies this task with integrated PRBS Patterns available with the push of a button. IoT and Embedded Engineers need to generate RS232 traffic to test control interfaces and communication links. This can be a challenge when you are bringing up your device. The DG800 and DG900 include an integrated RS232 generation capability to allow you to quickly set up and generate RS232 traffic from the instruments front panel.